This began as a color experiment trying watercolor over an acrylic wash on watercolor paper, and turned into a pure acrylic painting. I am in love with color of all flavors. This is Golden acrylics in heavy body, fluid, and high flow on a 3″ x 4″ sample of 260 lb. Arches cold-press watercolor paper graciously provided to me by one of the artists at Blick. I started by soaking the paper with a wash of Golden fluid and high-flow acrylic paint, dried that with a hair dryer, and decided to go back in with more acrylic instead of watercolor. I put some purple heavy body paint down in Cobalt Violet hue mixed with a bit of Titan Buff in places, sprayed it with a small spray bottle, and it seemed to declare itself. So, I tried to respond to what was in front of me, and brought out what I saw in the swirls of color, defining the shapes with light and dark tones. I would love to know what you see. Use of yellow and pink is great combination…Power and Love! Thanks so much, love that one! I can’t seem to get away from these colors lately. Oh, I see a lovely pink dragon breathing fire. She’s a very good dragon, of course. Gorgeous colors! It’s like I’m above her, looking down over the top of her head. I’m calling her Priscilla. No idea why. That’s just the name that comes into my head. The fire she’s breathing is sort of circling around her. It’s almost like I’m riding on her back and she has her head lowered. Oh that’s cool! Very imaginative, love it! Oh i am lost in the magical brilliance of this bright happy painting and that little drop of white in the left is so yummy! Gorgeous! Thanks, Jodi! This was already small but I cropped it even smaller to strengthen it some. Glad you liked it! What a combo, pure statement. I can see how it did Laura, powerful is certainly what it portrays. Wild pink waves rolling onto the shore. I see the very edge of a volcano erupting. A very pretty volcano. N.
Ooh, I like this one too thanks Nina! Glad you enjoyed. Another great one, thanks Dawn! Lots of great interpretations of this teeny crop of a 3×4″ painting. I am glad WP doesn’t make it look so teeny on the screen. lol. Thanks, Carmel, that’s where I was going with it. I like the rock add. Will I ever stop painting abstract. The 50 million dollar question. Hehe. I keep forgetting that I can click on the photo to enlarge it! silly me….Oh, I thought you were going to do faces but drawing….it is still a challenge, right? You aren’t going back on anything. I have had to re-think my June challenge but instead of every other day of posting, I will be posting twice a week (or more) and my focus will be painting the human body, faces and animals in watercolor. I will also continue on with plein air painting in watercolor. I will think about July as to what I will challenge myself with. Onward march! I had originally thought of alternating drawing with painting and painting more than drawing in June. Now I’m not sure. What I’ve noticed in May with this challenge is first, I really enjoy it, but second, I’m not getting a whole lot else done. I have lots of stuff I need to do both work-wise and around the house and they’re not getting done because I’m so excited about painting! I love blogging but I spend a lot of time on here socializing when I should be working or arting. I think maybe we’ve both found this. This weekend I’ve been pooped. Not sure if I’m sick or exhausted. I really need to be focusing on my main job right now, been pushing too many things to the side. Faces for me aren’t as time-consuming as painting is right now. I’d like to keep painting daily but right now I don’t think it’s working out time-wise and energy-wise. And sleep-wise lol. I really like what you’re shooting for for June. It sounds great and I 100% know that I will love watching you and hopefully doing some figure work as well – not sure if faces count as the figure, I guess so huh? Who knows, I don’t know the art terms for sure. I hope your eyes get restored soon. Do you like audiobooks? Yes I do…I always have an audio going along with my other books. Margaret’s painted in pastels a fair while, as I’ve been painting some time too. so that does make a difference. But, (older with issues) still… makes additional Challenges – a struggle. thats ok. 3 days left!!! Posting every day is a lot easier than painting every day IMO, but both are tough and time-consuming. Painting every day is wonderful and I would love if it were my FT job. But I think we are mankind’s recyclers. And it does take energy to take something and turn it into something else. It’s wonderful to be able to do it though. When I can sit down sad or upset or even mad and walk away refreshed and feeling like a million bucks, and have a piece of artwork to show for it? Pretty much a miracle in my book. exactly! you expressed that very well, Laura! I just told Laura…… counting. got 3 days, then I’m done. very difficult this was. I may not even return to my mon wed fri sat postings…. for a while. need a week to recup. I don’t blame you at all! I probably will post maybe two more times and then I’m going to take a break as well. I’m thinking at least twice a week, we’ll see. 🙂 whew…..! I like the idea of posting less regularly but with higher quality work! hehehe! need some mojo back!! You always make me feel great! lol I are artists in crime! Thanks, Jill! I did like it but I think for acrylic paint, it’s probably better to go heavier. I’ve never tried acrylics on 140# WC paper, have you? I really saturated the paper though but I thought it would stay flat because it was heavier. It didn’t. I’ve never used it before but it was one of the papers in the sample they sent. I’d never heard it existed. Always learning something new in this art world lol. I spoke to Patrick again the other day, he’s the artist at Blick who sent me all of the samples. That sample was mislabeled, I think he said it was actually a bit lighter than 140#. I think it should have said 260gsm instead. I believe 140# is 300gsm. So there you have it. The world makes a bit more sense again. I was wondering how this curled up if it’s almost 300#. I was blaming it on acrylics as I’ve never tried to paint Ac on WC paper before. Yes, this makes more sense to me too! Thanks, Laura! 😄 I am also trying out cradled wood board for some of my acrylics and collage pieces. You might like this surface too. I will try to post something on it next week. My eyes are very happy at the moment. I’m in love with all of these colors Laura. This little painting would look lovely in a shadow box raised a bit and floating in the frame. Your beautiful art work brings lot of joy our way! Thats an amazing effect Laura, like the tide rushing in onto sand. Thanks, Denis, much appreciated. I hope your drawing is going well! Aw what a kind thing to say, thank you Iris! You made my night. Oooh, I so love the waves of colour – how marvellous! ❤ I sure wish summer would come charging in like that over here! Thanks so much, Jacob, you’re very kind. Gorgeous, Laura! 💕😃Love seeing your experiments, your ideas are so great! That day i just had a glimpse at your post but was quite busy to dig in but today i wanted to look it closer so scrolled down and i got it ! So So lovely it is! the colors are so inspiring! Thanks so much, Snehal! You’re too kind. I’m really glad you are inspired by those colors. I bet you turn that inspiration into something gorgeous! Love the varying textures in this Laura, especially that blob of pure white….delicious! Gorgeous and stunning! 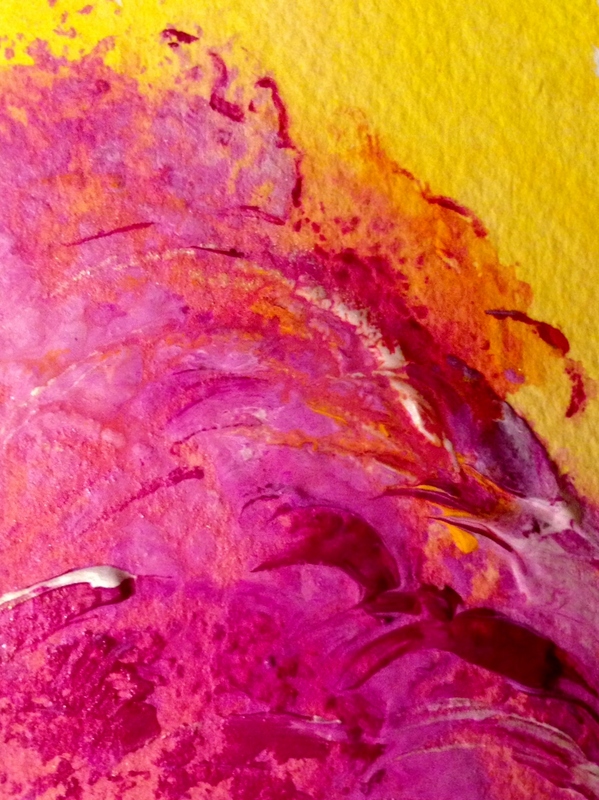 Love the vibrancy and movement, like a wave of saturated color…simply delicious. Laura, I love the way you played with the colors and its movements in your abstract painting. It certainly reflects summer. Thanks, Debi. It’s definitely a virus, fever started a couple of days ago. At least I know I’m not just exhausted, or worse, reacting to another food. I’ve eliminated too many as it is. Laura, it looks like waves in a sunset to me too. Vibrant and beautiful. Aw what a beautiful interpretation, thank you, sweet friend! Love it! I sent a reply on your post but WP may have deleted it because now it’s not saying I’ve replied or anything so I thought I’d reply here where I can see it immediately. I checked but I don’t have any emails from you. Can you resend it? I have just sent you the email. Hope you´ll get it! Maybe it went to the Spam before? Ann I just emailed you a different gmail address maybe that one will work? It wasn’t in my spam folder either. I also just thought I´ll try out my gmail-address… 😄 This is really funny. Just a second, now it will work! Comcast didn´t work again, but I think gmail worked… Did you get it? And I just sent one back, hope you got it? These colours are amazing, Laura, and the fact that you play around with them so much and so productively is a constant inspiration for me. Which is why I have nominated you for a Liebster Award! Liebster is a German word and means ‘most favourite’. The award’s goal is to make high-quality blogs more widely known. There are a couple of questions attached to the award which the winner is invited to answer so that everyone gets to know the blogger behind the blog better. I hope you will accept the award and tell us more about your creative work! You can find the questions here (toward the bottom) https://antjebednarekgilland.wordpress.com/2016/05/29/thank-you-for-the-liebster-award/ Cheers! Thanks so much Antje, that’s very kind of you! And I am glad, too, that you appreciate this little painting. Time constraints prevent me from participating in awards, but again, thank you most heartily!